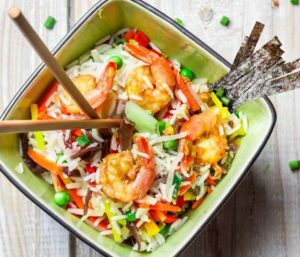 Enjoy this tasty Shrimp Fried Rice dish seasoned with our Miso Master Organic Miso Tamari and garnished with our Emerald Cove Organic Toasted Nori, YUM!. Heat skillet or wok; add oil and sauté scallions, celery, and carrots over medium heat until carrots are soft. Break up any lumps in rice and add to vegetables with tamari, peas, and shrimp. Continue to stir over medium heat until soy sauce is evenly distributed and rice and shrimp are hot. Cut Emerald Cove Organic Toasted Sushi Nori sheet into narrow strips and top for a tasty and nutritious garnish.